The building’s parking facilities are three-fold: Valet, P-1, and the Welton Street Parking Garage. 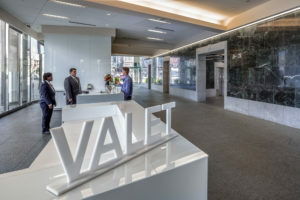 1999 Broadway is the only commercial office tower in Denver having its own valet service. The valet is managed by a professional valet and parking management company. The valet desk is located on the plaza on the north side of the building by Broadway. Monthly, daily and hourly rates for valet services are available. Tipping the valet is discouraged. Tenants electing to validate valet services for their clients or visitors my purchases a sheet of coupons in various denominations directly from the valet manager. Please contact Laz Parking at 303.297.3248 for more information about the valet program. The nine-story, fully enclosed parking garage is located at 2099 Welton Street, approximately a block and a half from 1999 Broadway. This 665-stall structure contains undesignated parking, designated parking, motorcycle parking and bicycle parking. Parkers may access the garage by using their programmed building security access ID card. Please contact Laz Parking at 303.297.3248 for the monthly parking rates. The Welton Street Parking Garage is a secure facility. The 1999 Broadway security staff monitors all ingress and egress by access cards and four closed circuit television cameras. Tenants electing to ride their bicycles to work may use one of three bicycle parking facilities: bicycle parking room inside the P-1 mail room, bicycle parking immediately inside the P-1 ramp, and overflow bicycle parking at the Welton Street Parking Garage. No bicycles are permitted in the building other than on the P-1 level.